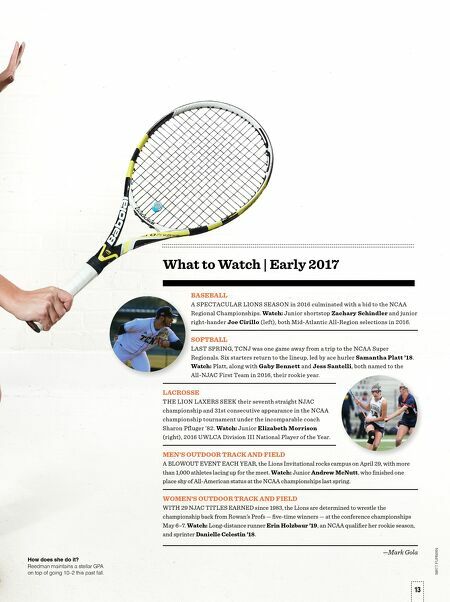 12 WINTER 2017 12 WINTER 2017 SPORTS > How I Got Here > BRITTANY REEDMAN '18 12 WINTER 2017 PRAIRIE > I started playing tennis at the end of seventh grade. I had played every sport. I figured I'd give it a try for fun. I ended up loving it and dropped all the others. > This fall, the TCNJ team won the New Jersey Athletic Conference for the 34th year in a row. In our conference, we've won 171 straight matches. We do very well in the fall. In the spring, we play nationally ranked teams, and they're more competitive. > I try to get my work done as efficiently as possible. The second you start realizing how much stuff you have to do, you'll get overwhelmed. So I just keep calm. > I love being involved on campus. I'm the president of Women in Computer Science; secretary of the Association for Computing Machinery; secretary of Pi Mu Epsilon, the mathematics honor society; and treasurer of Upsilon Pi Epsilon, the computer science honors society. > I'm very involved in getting more women into technical fields like computer science. My classes are primarily male. > My mom was a computer science major. Without my mother, I would have stayed with math. A lot of women don't have that influence in their life, and they don't find out about the field. > She told me to try one computer science course — if I didn't like it, I could drop it. A week later, I loved it. I told her, "I'm going to be a computer science major." She was very excited. > I spent the summer interning at Microsoft. There were 1,600 interns from all around the world. I'm interested in software development. I worked on a machine-learning application that is going to be launched soon. It simplifies the process of making predictions about data. > I lived in Seattle for three months. On weekends, they would take us all hiking. We even had a private Ellie Goulding concert. > The Microsoft campus is like a playground. There were rock-climbing walls in my office. It was very cool. 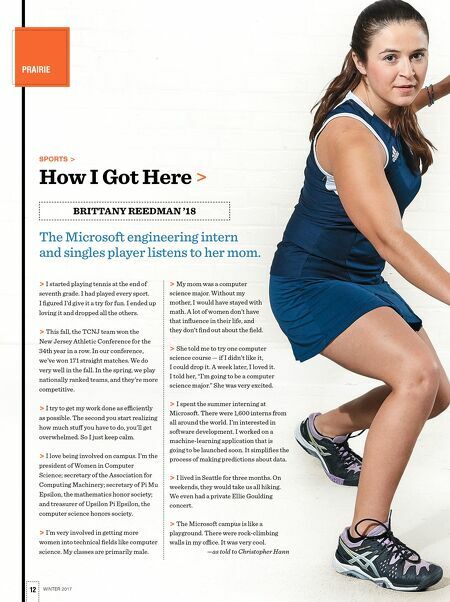 —as told to Christopher Hann The Microsoft engineering intern and singles player listens to her mom.